Heavy duty laminators for commercial laminating services, digital imaging service, color labs, printing businesses, military installations, map publishers. That's what the heavy-duty Ledco 38 and 60-inch are all about. Owners of these machines say there is nothing else like them for dependability, speed, quality of lamination, ease-of-use, and low maintenance. These machines have old-fashioned value...that is, the work and revenue they can produce far exceeds their cost to purchase and service. The demand for lamination of larger materials is rapidly growing, yet only a fraction of all laminating services have a machine that will handle materials 36 inches or bigger. 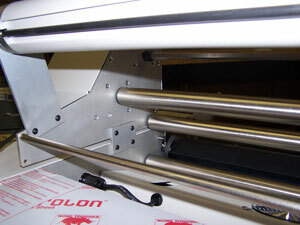 Most laminators in finishing departments or shops are 25 inches wide. 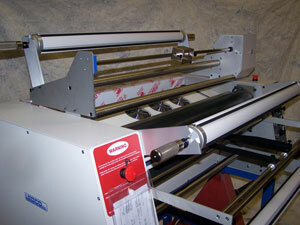 These big Industrial Series laminators can help you enter this market or increase your capacity to handle big sheets. Who uses big laminators? Laminating services. Digital imaging services. Color labs. Printing businesses. Reprographics shops. Government offices. Military installations. Map publishers. Any organization that needs to protect large-format printed materials. Laminating and pull rollers are covered with quality silicone rubber for superior release quality, higher lamination quality and easier cleaning. The laminating rollers and pull rollers are interchangeable to help keep maintenance costs down. Pneumatic power opens or closes the laminating and pull rollers and gives you a precise and independent control of roll pressure. A compressor is built in so that shop air is not required. Removable heat shoes are Teflon coated to reduce film abrasion. They are easily unplugged and removed to clean or replace the laminating rollers. Forced air cooling is essential when running thicker films, because the lamination needs to be cooled to get good results. These machines have rows of fans mounted above and below the film as it leaves the laminating rollers. The safety guard is built into the feed tray, and the machine will not run without the feed tray in place. Stop buttons on both sides of the machine front and back contribute to a complete safety package. The back rollers are also guarded. Both upper and lower rollers are driven to minimize the wrinkling or curling that can occur when one roller is driven. 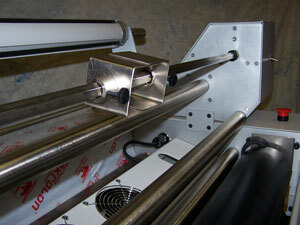 A removable bottom idler bar makes it much easier to thread film. Standard precision feed tray has both left and right side guides and is adjustable from a few inches to the width of the machine. Footage counter enables accurate measurement of film. Call for price. Additional slitters permit multiple-up cutting. Call for price. 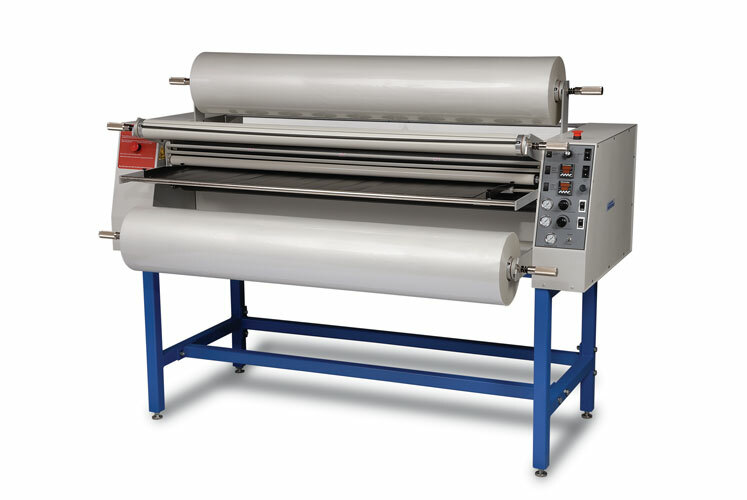 Max Laminating Width 38" 60"
Laminating Roller Diameter 3" 3"
Supply Roll Core Size 3" 3"
Max Laminating Thickness 1/2" 1/2"
Max Film Roll Diameter 16" 16"
Weight / Shipping Weight 565 lbs. / 1,000 lbs. 865 lbs. / 1,300 lbs. 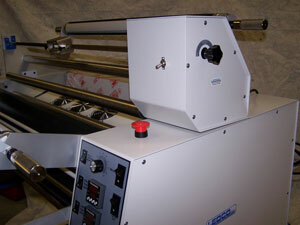 The The Industrial series laminators required a mandatory crating for shipping.